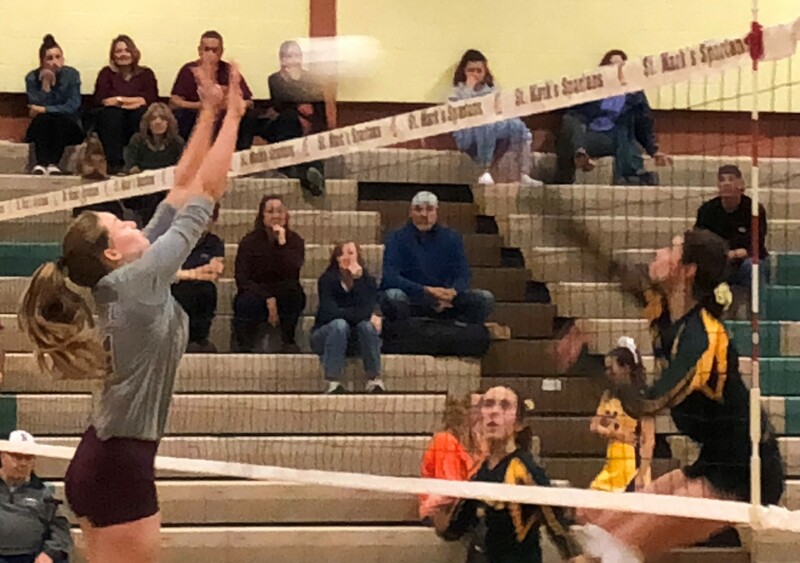 MILLTOWN – Caravel stunned St. Mark’s in the first set of the teams’ first-round DIAA volleyball state tournament matchup on Nov. 1, but the 10th-seeded Spartans rebounded with overwhelming force in the second and went on to a 3-1 win over the Buccaneers, who came in at No. 23. 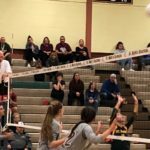 Set scores were 22-25, 25-12, 25-16, and 25-18. 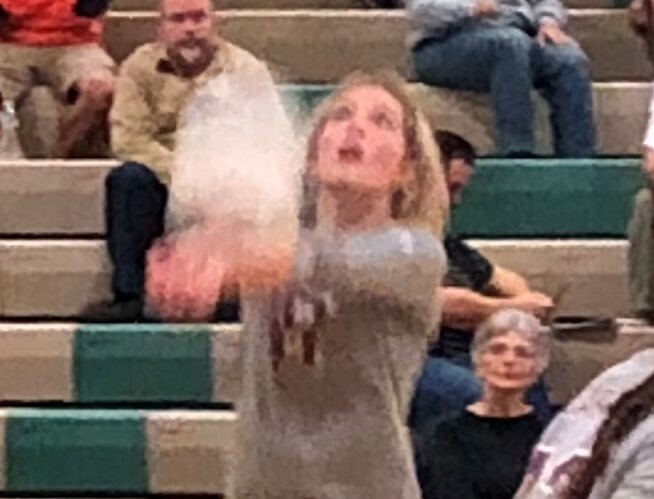 Savannah Seemans, St. Mark’s all-state outside hitter, opened the match with what would become a familiar sight, a crosscourt winner. 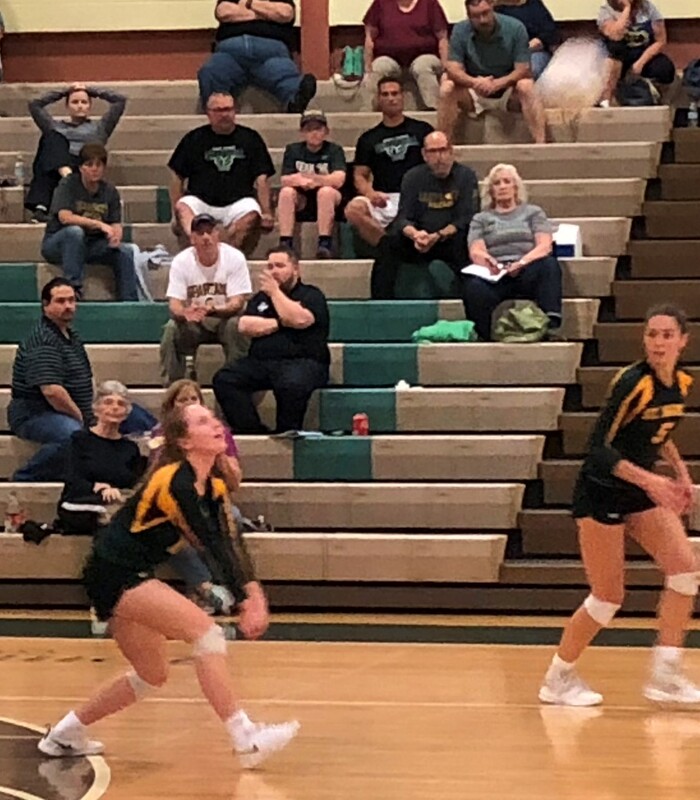 In fact, the Spartans’ first four points all were courtesy of Seemans’ right arm, but while the Buccaneers might have been impressed with her play, they were not intimidated and kept the score close. The teams were tied at each point between 7 and 10 before the Bucs took the lead. 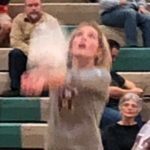 Two St. Mark’s hitting errors, followed by a kill from Nicki Marcon, gave Caravel the 13-10 advantage. 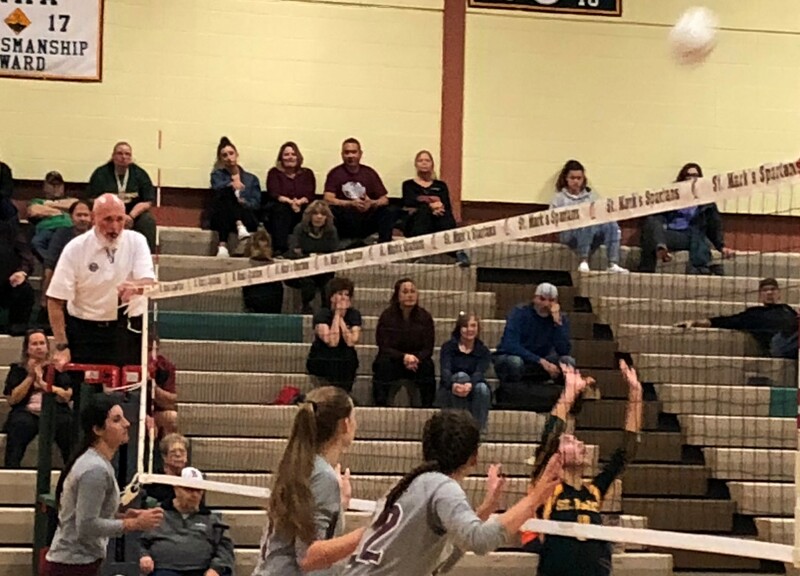 The teams traded points for a while, with the lead fluctuating between two and three, until Courtney Maxwell served up an ace for the Bucs to make it 21-17. 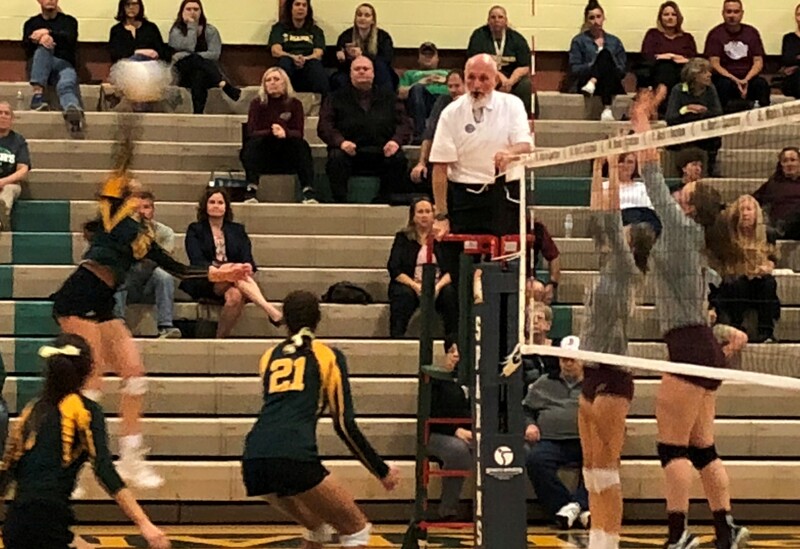 The Spartans bounced back with the next three, and Brooke Dow made it a one-point deficit for the final time at 23-22 with a smash down the middle. 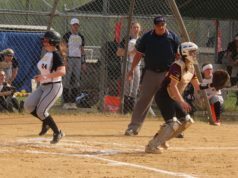 Two unforced Spartans errors closed it out for Caravel. The Buccaneers started with the serve in the second, but Seemans went crosscourt to open the scoring, sending Dow to the end line. 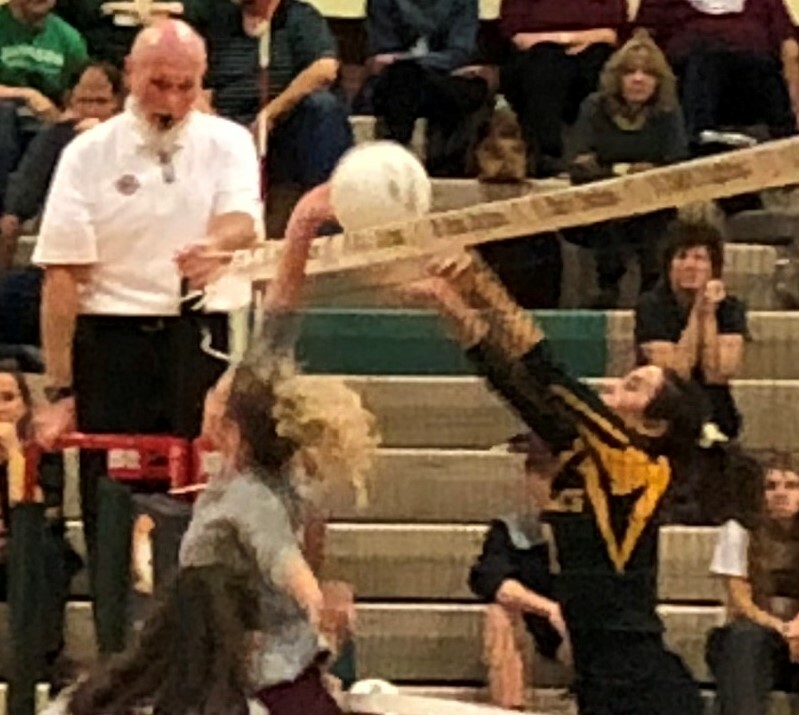 She would be there for the next eight points: two errors by Caravel, a block by Mya Lewis, a wayward dig by the Bucs, an ace, a Seemans block and two more errors. Maxwell ended the run with a kill, but the Spartans were on their way. 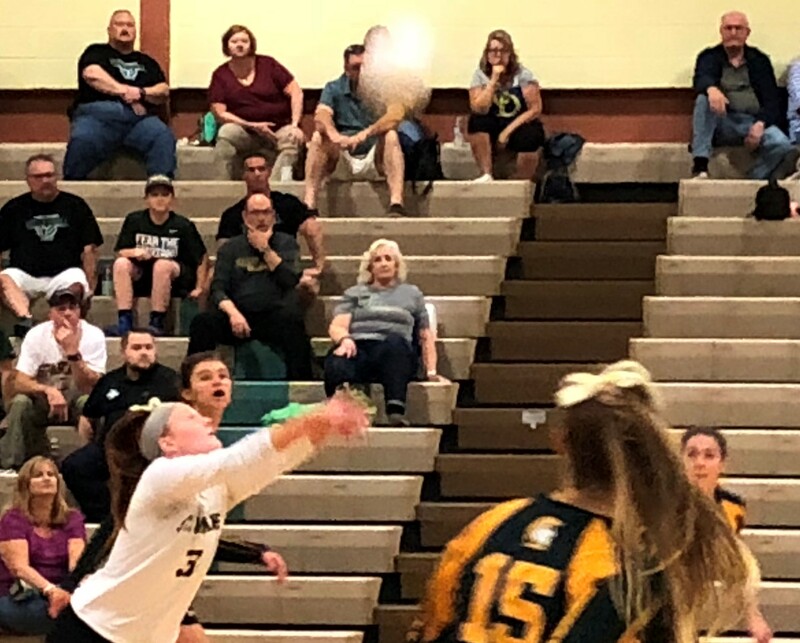 The biggest lead was 15, at 23-8, thanks in large part to Seemans and Abby Thibodeau up front, and a pair of aces from Kyla Dow. 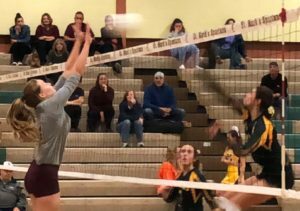 Caravel scored four of the next five points, but a push kill from Seemans was the clincher. The Bucs bounced back in the third, taking a 2-0 lead on a smash from Maxwell and an ace for Colleen Sheridan, but the Spartans fought back. Four straight points, the last two an ace from Brooke Dow and a Seemans kill, gave them a 12-10 advantage. The hosts went on an 8-1 run to extend the lead to 22-14, and Brooke Dow scored the winning point with a block. 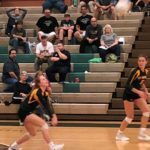 The fourth set resembled the second, as Seemans accounted for three of the first four points with two kills and a block. Mya Lewis chipped in with a smash, then a block, prompting the Buccaneers to call a timeout. Haylee Mulvena went down the middle out of the timeout to get Caravel on the board, but the Bucs had a large hole from which to climb out. 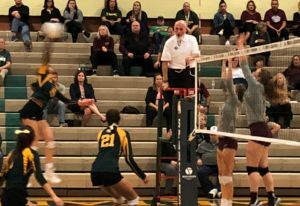 Maxwell, who was outstanding in her final high school match, led a valiant effort to keep Caravel close, but the Spartans kept the advantage in the six- to seven-point range. 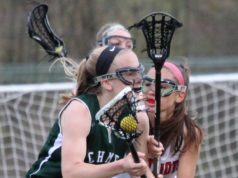 Cameron Chapman found a hole in the Spartans’ defense to pull Caravel within four at 20-16, but Katie Sonchen ended the evening with a bump that found an empty space. S. Mark’s statistics were not available late Thursday. 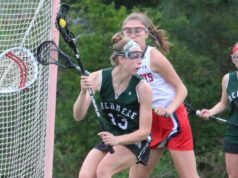 The Spartans improved to 9-7 and meet the seventh seed, Smyrna, on Saturday night at 6 at Archmere. For the Buccaneers, Maxwell finished with 12 kills and 21 digs. 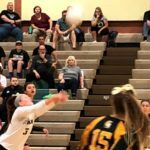 Marcon had 29 digs and seven kills. Caravel finished its season at 8-8. 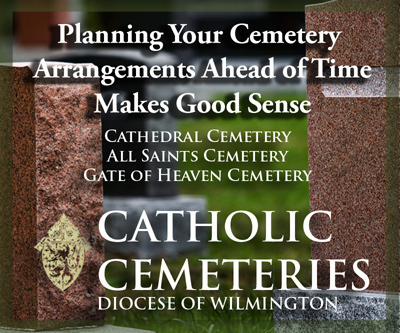 Two other Catholic schools played on Thursday. St. Elizabeth, the 21st seed, fell at No. 12 Newark Charter, 3-0. The Vikings finished with a record of 7-9. The 19th seed, St. Thomas More, was swept by No. 14 Red Lion at Tower Hill. The Ravens wrapped up the season at 10-6.